Every dog's first day is FREE! The Wags & Wiggles difference is the level of supervision and activity-based dog daycare. Our staff-to-dog ratio is the highest of all Orange County dog daycares. Our caring team is well-organized, extensively educated, and highly dedicated. Dog play and socialization are both important, however, basic manners and activities produce a calm, friendly environment. Dogs don't just come to play, they come to learn! We welcome all sizes and friendly play styles. Our 30,000 square feet campuses allow dogs to run and play freely. Quick Train Sessions engage dog's minds and allow staff to control our packs with positive reinforcement. Our registration process is EASY! 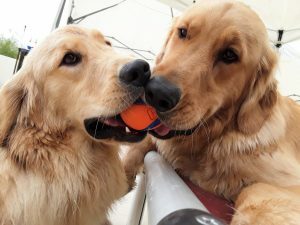 In order to ensure all our canine clientele enjoy their time in daycare with us, we require all new clients to schedule a meet and greet appointment before coming in for daycare. This carefully arranged introduction to our pack makes the first day as stress-free as possible. NOTE: We HIGHLY recommend reservations for daycare. If you don’t have a daycare reservation, it is first come, first serve. We do fill up for daycare some days, especially during the summer months and around major holidays. Make a reservation online or over the phone. We require 24 hours notice to cancel any daycare reservation. If you give less than 24 hours notice, you will be charged for the full day. If you have a pass, the day will be deducted from your pass. Wags & Wiggles is truly unique. Quick Train sessions teach dogs to come to their names and sit in the playgroup. Geniuses try down-stays on mats and tricks like "shake." If your dog has food allergies or a sensitive stomach, he or she does not have to participate. You can bring a lunch or request a nap. These are included with no extra fee! Days are scheduled for active periods and rest periods. Yappy Hour breaks up the pack into groups to play specialized games. Play groups are 100% supervised. Vaccines, medical concerns, behavior history, and special requests are all tracked with a specially designed management system. Communication between our team, our managers, and you is our number one priority. Most Waggers love our pre-paid discount passes! You can track the amount of days left on your daycare pass through our online software Gingr. We offer complimentary online report cards with photos and videos. See your dog in action! View our Webcams on your desktop, cell phone, or tablet. Late pick up until 9 pm every day! Join our super popular monthly newsletter, made special for our Waggers! © 2019 Wags & Wiggles - Site Created & Managed By: Web Designs Your Way, LLC.